Have you ever yarnbombed a yarnbomb? I have! 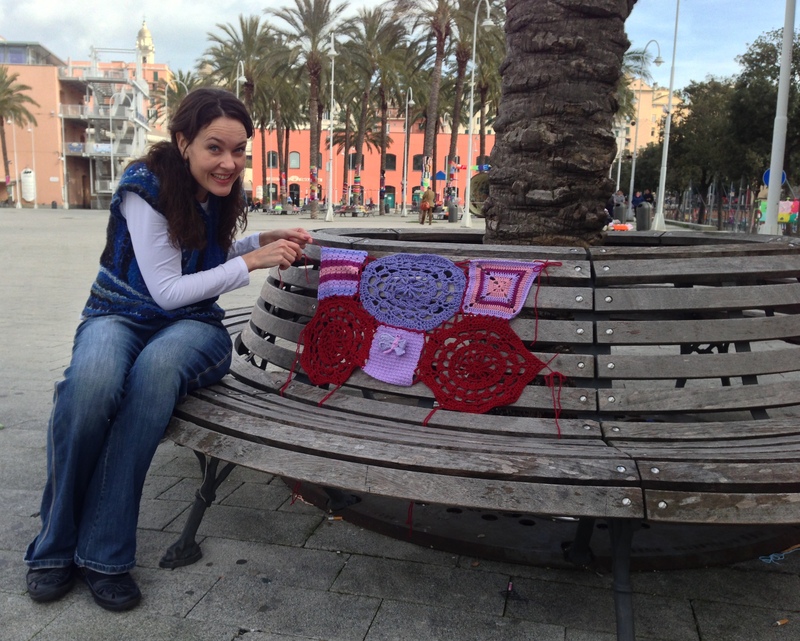 Mo, a very sweet Blogworld friend, read my post about my trip to Genoa to see Intrecci Urbani and asked me whether I would take something crocheted along to put up on her behalf. I thought it was a great idea, so of course I agreed. Mo sent me three hexagon crochet motifs and a dragonfly. The hexagons were leftovers from this blanket, done in a very soft luxurious naturallycaron yarn. The Dragonfly is the cutest little thing! Her colours immediately reminded me of squares I had made for Rachel’s Crochet Along (which I had given up on….). I was planning to take one or two of my CAL blocks with me to Genoa anyway, so when Mo’s hexagons arrived I decided to combine our pieces into one! 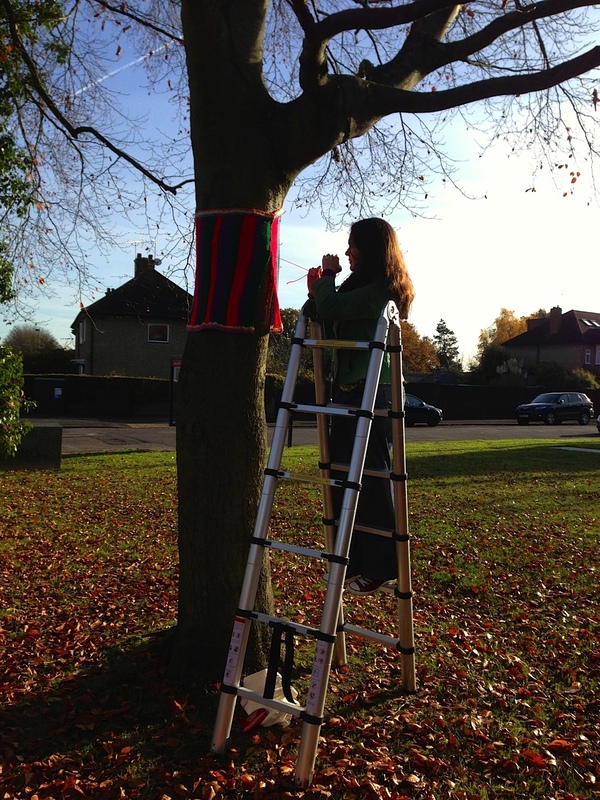 That way I could quickly attach our yarnbomb to wherever – thinking one big piece will be quicker to put up than six smaller pieces. I used my Twin Stripes, Tiny Textures and Square Target squares from the CAL. I blogged about them, and others, here. Mo’s dragonfly was sewed onto the Tiny Textures block and I had a deep red Stylecraft DK in my stash that matched Mo’s hexagons perfectly, so I used that to crochet everything together. I attached long pieces of yarn to 6 corners of the piece so that I could just tie it to wherever, without having to worry about doing any sewing. 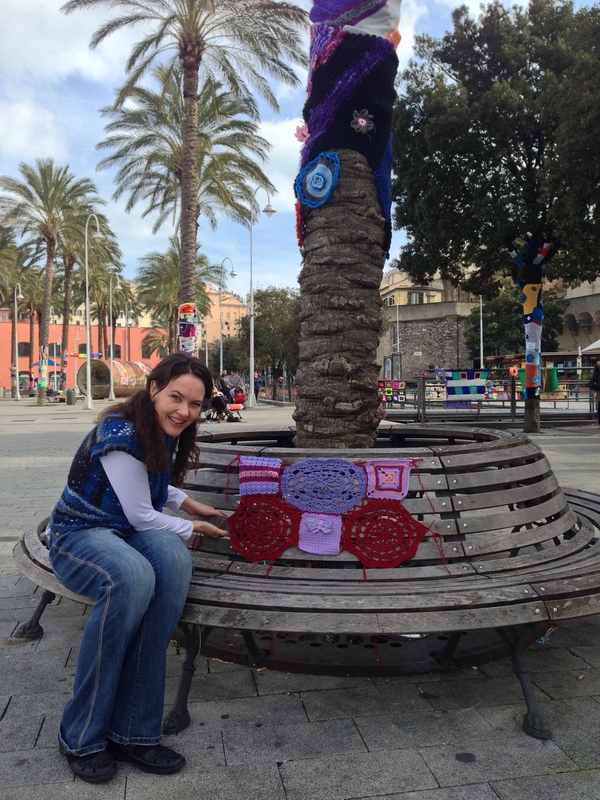 On Friday I took our hexagons & squares yarnbomb piece with me when I went exploring in Genoa. John pointed out the bench below. It was one of only a few that hadn’t been yarnbombed. The perfect victim! Using simple bows to tie the piece to the bench worked really well. 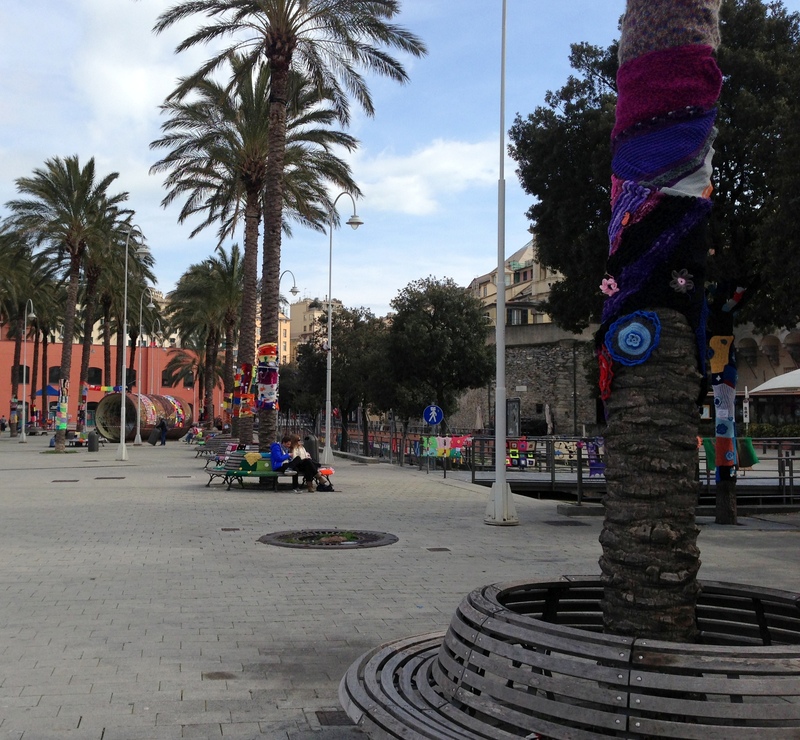 Intrecci Urbani, the big yarnbombing event in Genoa that I visited over the weekend, was so big I will have split up my photo posts into at least five posts! This is the final post, post six (I did say “at least”…). You will find post one here, post two here, post three here, post four here and post five here. 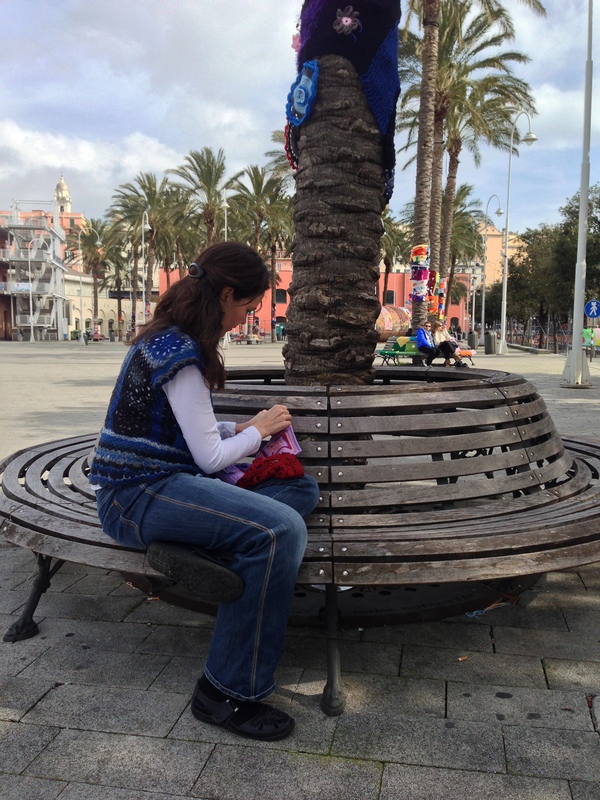 Below is a WordPress gallery of people interacting with the yarnbomb (and a statue of Ghandi. He is a person after all). John and I both noticed how dreary, dark, sometimes dirty and run down Genoa is. We could totally see why residence would want to do something to liven up the place. The yarnbomb made me very excited and I was smiling the whole time, but I was definitely in the minority. Everyone else just walked past, gloomy as ever. I can’t imagine that all that colour, softness and talent could be lost on anyone, so I’m choosing to think they were all smiling inside. Surely…. 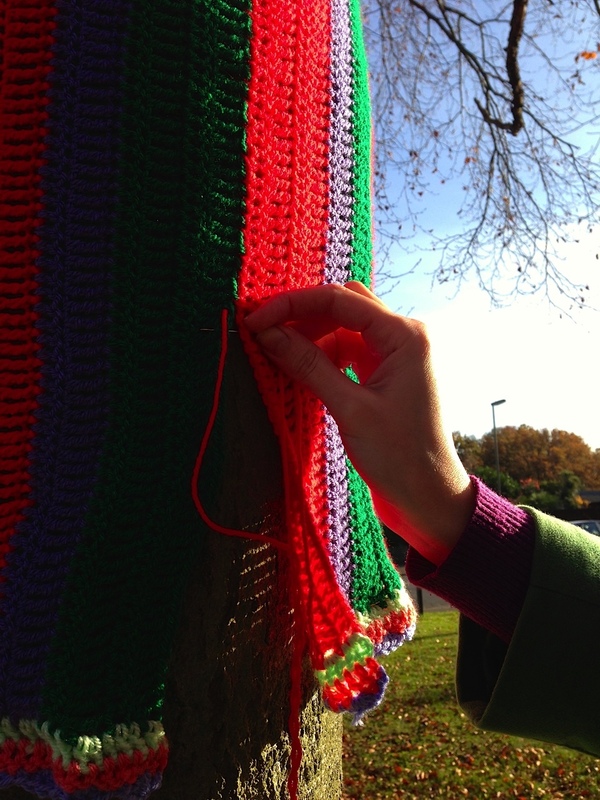 You can be part of a yarnbomb! 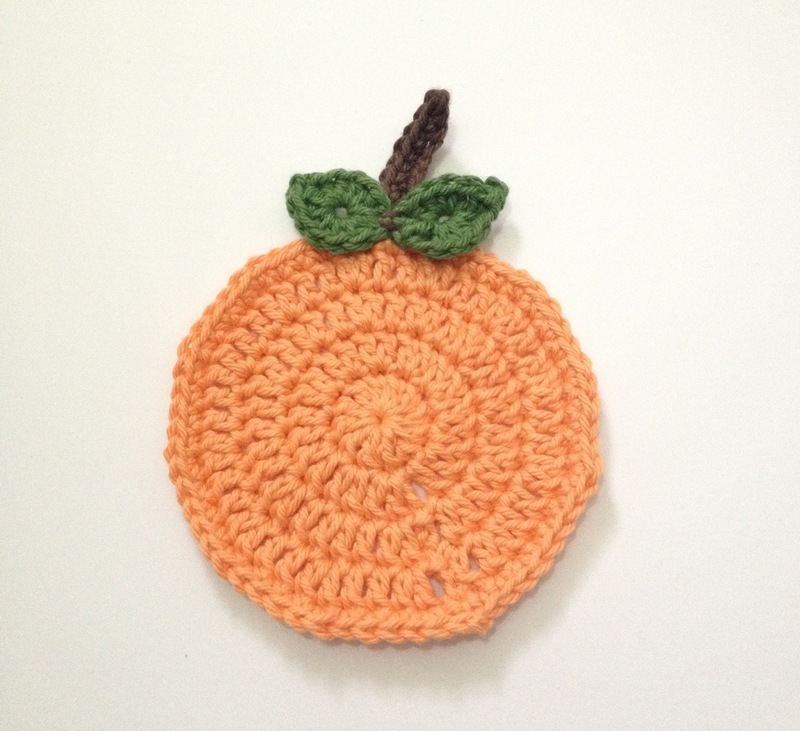 All you have to do is crochet a piece of fruit and post it to me. 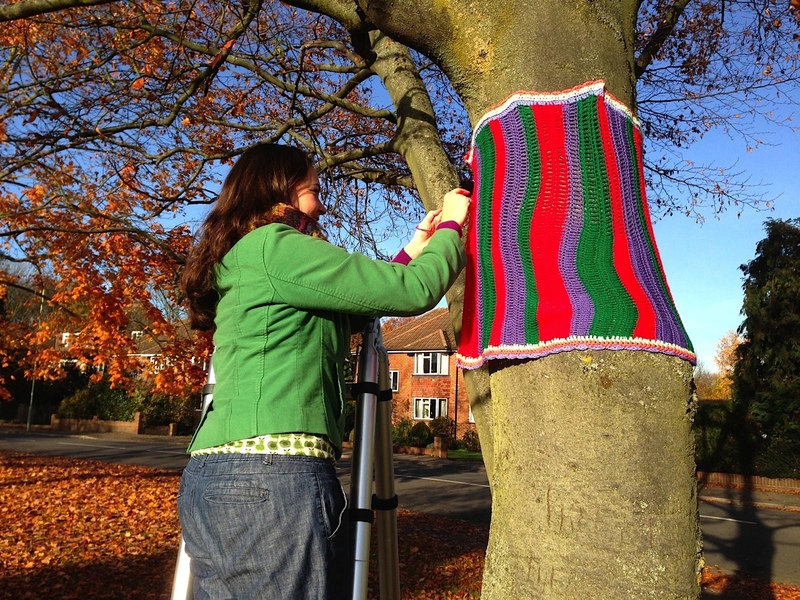 No measurements to take, no getting onto ladders, no braving the elements to put up the yarnbomb. You dont even have to find a pattern, I’ll supply you with one. Just raid your stash, hook and go to the post office. Are you in? Want to know more? 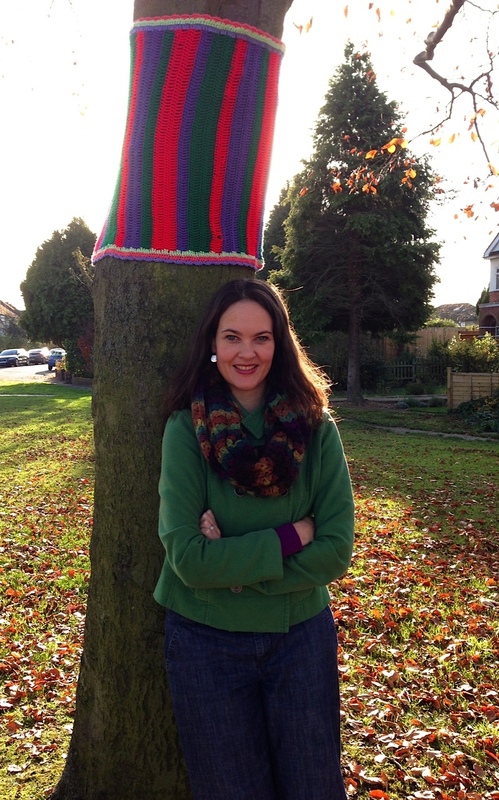 The yarnbomb is for Surbiton’s first annual Food Festival from 4 to 19 May 2013. The organisers contacted Bobi of The Craft Inn to do the marketing for the festival and being a crafter extrodinaire she immediately thought of a craftbomb. My Thames Ditton yarnbombs (here, here and here) caught her attention so she asked me if I wanted to be part of this great crafty endeavour. Of course I said yes! I don’t want to tell you exactly what I’m planning or how I’m going to use your fruit, but I can tell you that I need to cover a lot of space. 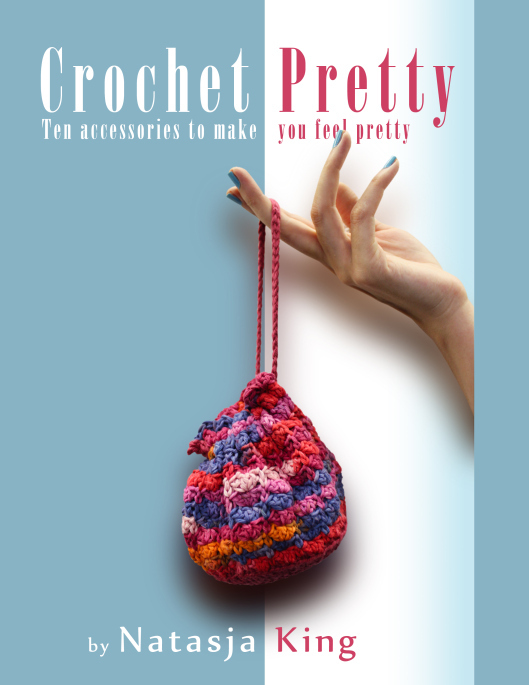 I need a lot, or big pieces, of crochet. All before 29 March. This is where you come in. 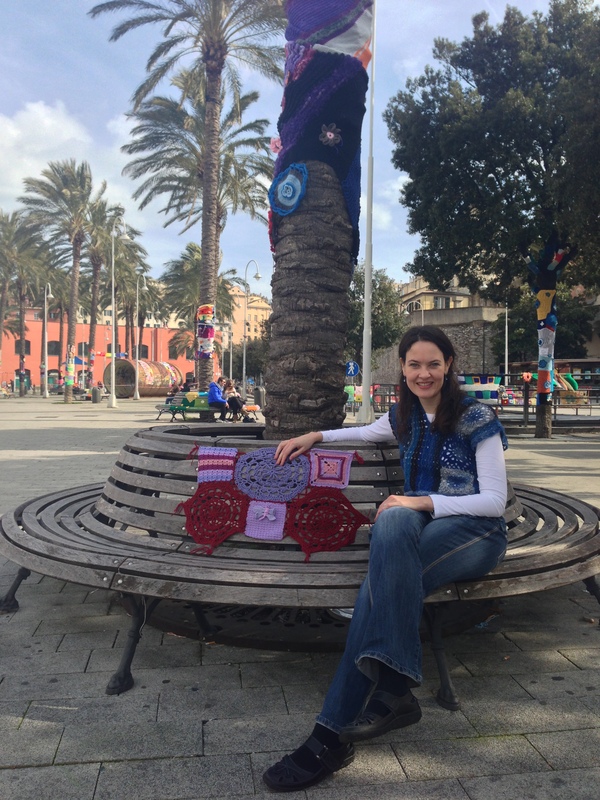 It would be great if my blog buddies from all over the world could be part of the yarnbomb. A multi-national fruit salad for Surbiton! As I receive your pieces I’ll give you credit on this blog and if you include a business card, I will attach it to one of your fruit as well . 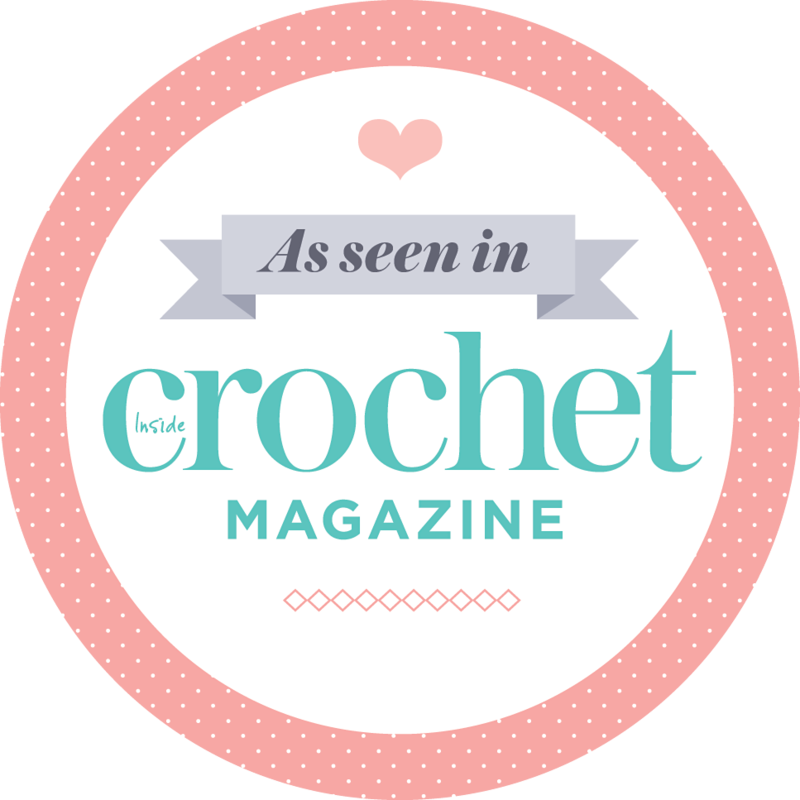 Due to a change of venue I will no longer be able to attach business cards to the crochet. 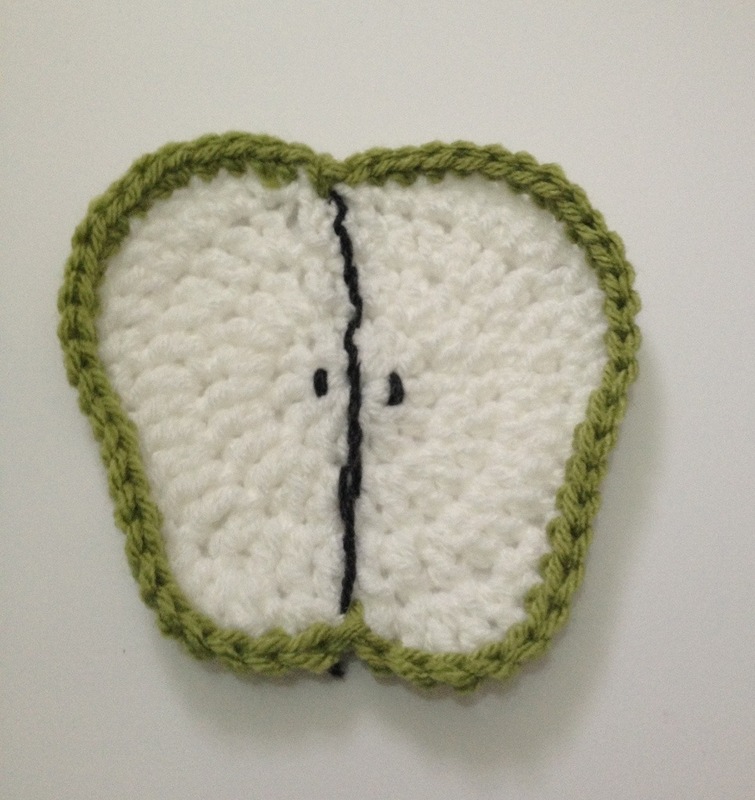 As for the pattern, you can find it here: Fruit crochet for Surbiton Food Festival (the link will open a PDF document). The pattern is in fact four crochet fruit coaster patterns, all courtesy of Louise Howe of the Lally Lou Lou blog, that I just put together in one document. Louise’s original patterns can be found here and here. Thank you so, so, so much Louise for agreeing to me using your fruit coasters for the yarnbomb. Dear readers, Louise has also promised to send me a couple of apples, pears and strawberries to use in the yarnbomb. 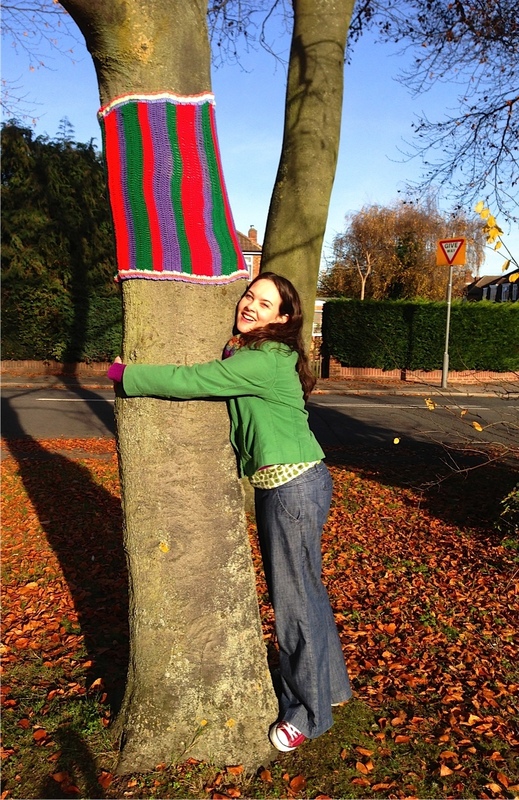 It’s only right that the designer should have her handiwork included in the yarnbomb, don’t you think? These are the fruit that I’ve made so far. I used Double Knit, Aran and Chunky yarn. I think towards the deadline of 29 March I’ll probably be sticking to only Chunky yarn as it works up so quickly. I just want to stress that (if you haven’t already gathered this from my backstitch, strawberry hairs and pear leaf mistakes) the fruit doesn’t have to be perfect. Honestly, it’s just a bit of fun (I can hear Uncle Bryn‘s voice in my head as I’m typing here). 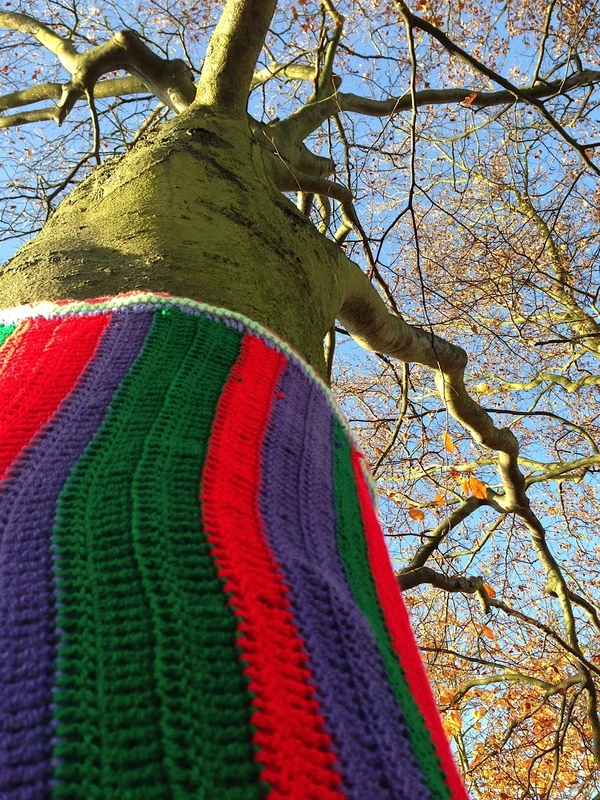 The yarnbomb will be outside during the British Month Of April and when all the pieces of crochet are put together no-one will notice mistakes, so just enjoy it. 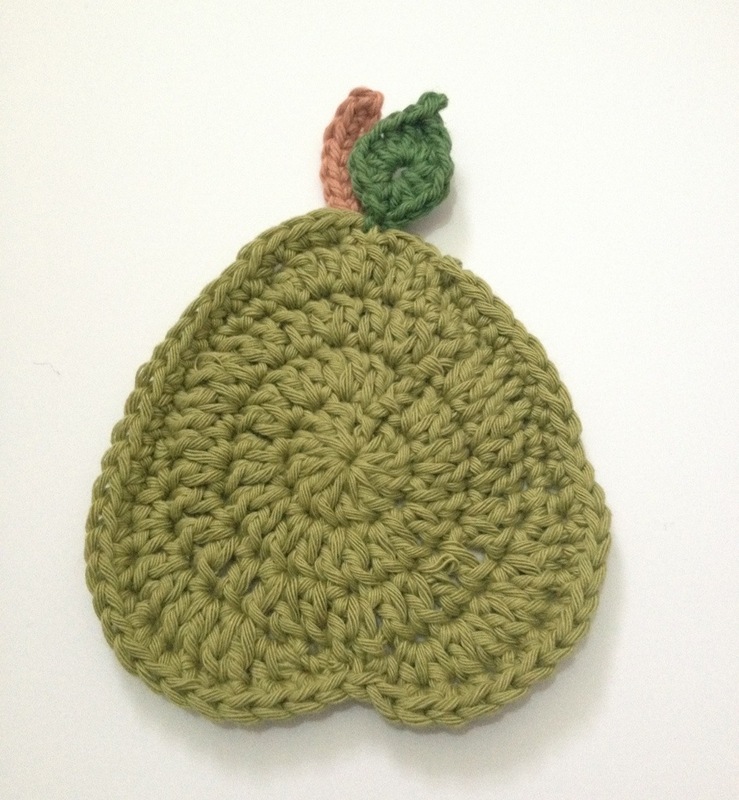 And of course you can send me any crocheted fruit, you don’t have to use Louise’s pattern. In fact, I hope someone will send me something different. The multi-national fruit salad could do with lemon, lime, cherry and banana. 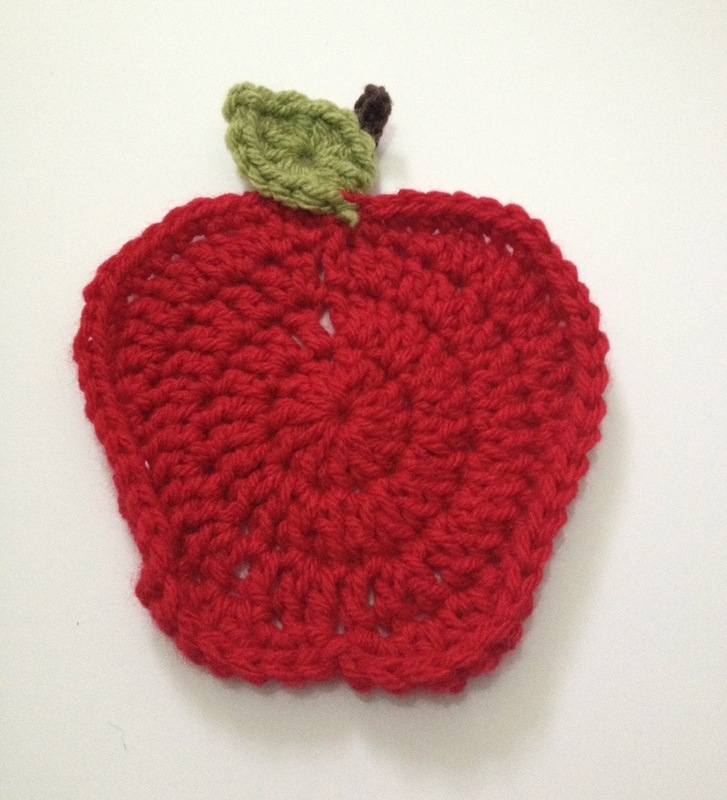 When you’re ready to post me your crocheted fruit, send me a message and I will email you my address. The yarnbomb will be going up over the Easter weekend, and I need time to do my thing to turn the pieces into a workable yarnbomb, so I need your fruit before 22 March 2013 please. I’m really looking forward to receiving your yarnbomb contributions. 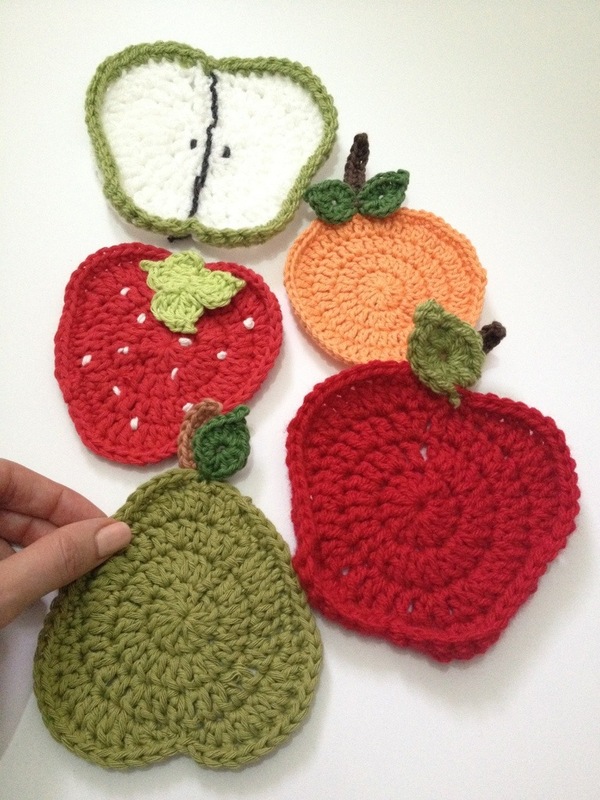 Remember, every time you finish a piece of crocheted fruit, it counts as one of your five a day. Fact. 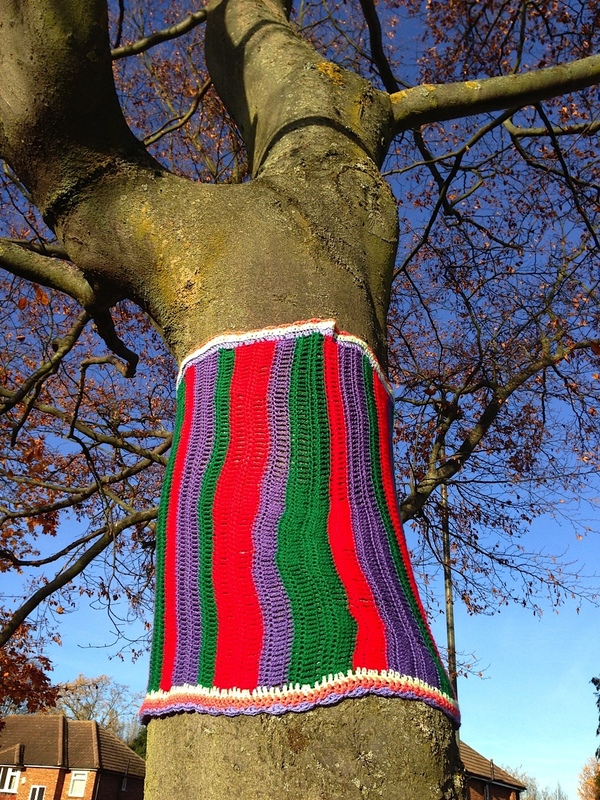 Another yarnbomb for Thames Ditton! This time I covered a tree at the roundabout of Speer and Summer Roads. I love how it turned out!!! The colours turned out to be a very wise choice. It really pops. What looks like a white horizontal border from afar, is actually a light mint green. I wanted to make a big impact. The initial idea was to do three trees, each in a different colour, later evolving to a an idea for one tree covered from leaf to root in different pieces of crochet, but in the end I settled for this. Once I started work on the first “tree scarf” as Hubby likes to call it, I realised it was going to take a very long time (those trees are more than a meter in diameter!) 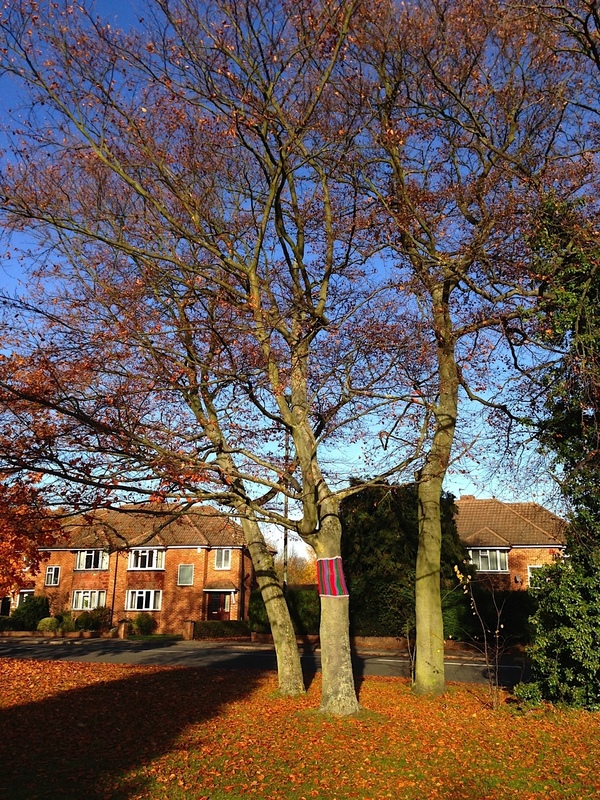 so I changed my mind I did one tree in three colours. I was also conscious of the fact that people will probably try to pull/tear/damage my crochet, as proven by the then nine, now four squares at Thames Ditton station. 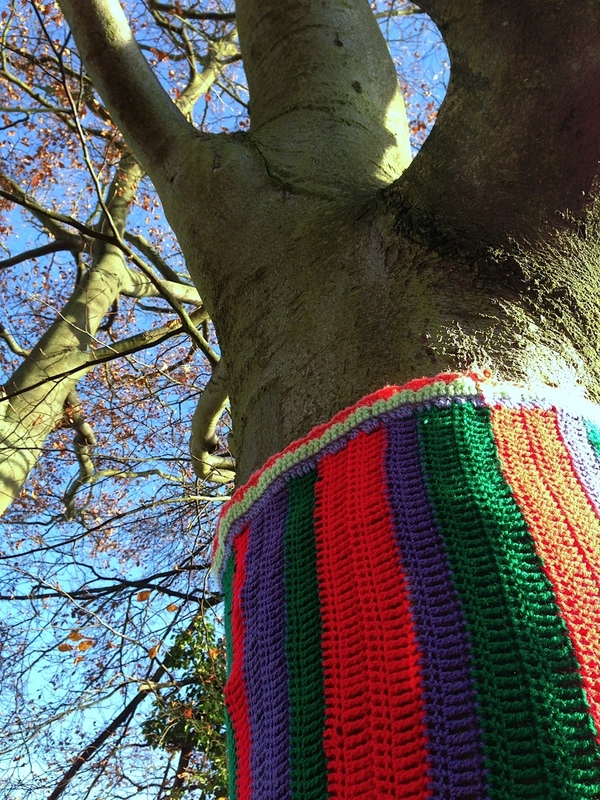 For this reason I attached my yarnbomb as high as possible to the tree. Stand-on-a-ladder high! The scalloped edge won’t be visible if you drive past, but if you walk, you can appreciate the frilly, feminine, touch. I really, really, like how this yarnbomb turned out. Can you tell? 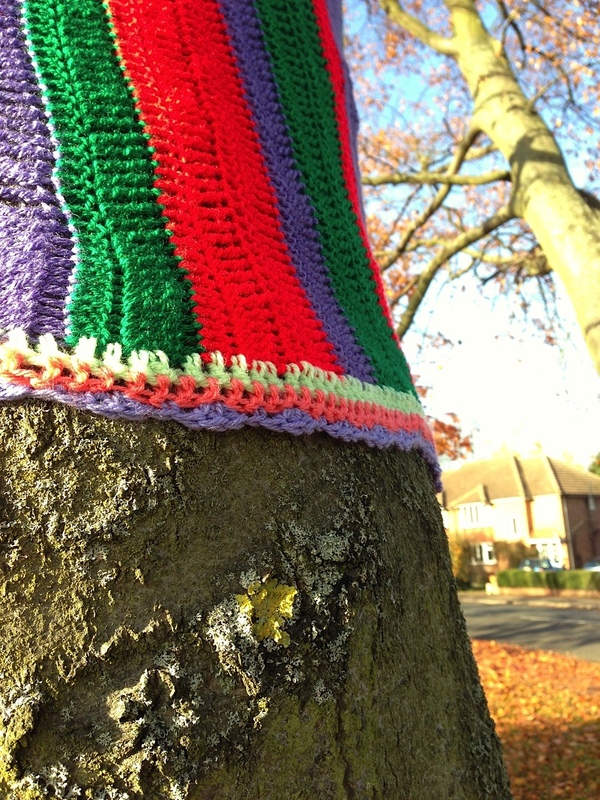 I would have loved to cover the whole tree trunk in a beautiful piece of crochet but it’s just sooooo heart breaking for me when I see my crochet damaged. I had to think practical (as practical as any person who crochets coverings for a tree would think) and “held back” on the creativity in order that the one piece I did do, would stay put. I actually said to my husband “I don’t want my crochet to get hurt”. Only when I had said those words did I realise how I truly felt about my yarnbombing. Every stitch is a little part of me. All I want to do is spread joy and cheer, so when someone removes or damages my crochet it really does hurt. I’m a yarnbomber and proud of it.